The British energy company BP is perhaps currently best known for last year’s fatal Deepwater Horizon explosion and oil spill disaster in the Gulf of Mexico. The company is also big news in Indonesia, where it is one of Indonesia’s biggest investors. Once Rio Tinto’s partner in the massive Kaltim Prima coal mine in East Kalimantan,1 the company is now operating the US$5 billion Tangguh gas extraction and liquefied natural gas processing project in Bintuni Bay, West Papua. This giant project. which has been developed on the customary land of indigenous Papuan peoples, is bringing huge changes to Bintuni Bay, its peoples and its environment. Since plans to develop Tangguh were announced, DTE has tracked the project’s progress and raised concerns about human rights, and social and environmental impacts. We have highlighted calls to halt the project until concerns about these issues have been properly addressed. We have objected to the investment of public money via the ADB in Tangguh, and raised concerns about climate change impacts. DTE has also regularly attended annual meetings with the advisory panel set up by BP (TIAP) to address these concerns to the company directly. BP constantly assures audiences in Papua, Indonesia and London that Tangguh is a ‘world-class’ project, with high standards on human rights, the environment and social responsibility. But what do these commitments really mean for people on the ground? Recent reports say that the company’s social programme has not materialised as originally planned, and local people are angry about the lack of employment opportunities, loss or restrictions on livelihoods and the lack of meaningful communication with company. 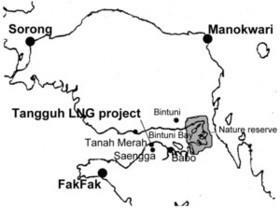 As Tangguh’s gas is extracted from under Bintuni Bay and processed into LNG to be shipped out to markets in China, Korea and elsewhere, precisely if or how local communities will benefit in the long run remains to be seen. In the meantime, DTE believes that local communities will have a stronger basis to press for social and environmental accountability from BP if they have access to fuller information about the commitments BP has made to them. With this in mind, DTE has published details of BP’s commitments to environmental and human rights standards at Tangguh. The compilation is available in English and Indonesian. 1.See DTE 85-86, August 2010.